One of the pieces that I continually value for my growth both personally and professionally is reading. Amongst other aspects, there’s a common theme between people who reach the pinnacle in their given discipline and that is reading. Continual consumption of knowledge, insight, and a pursuit for growth. If there was one thing we could all improve upon for 2019, reading more. I challenge you to set aside time in your calendar each day to sit down, disconnect from the world, and read someone else’s thoughts. Aim to read a book each month for a full year. If you average 10 pages per day, you’ll get through a 300 page book each month. That’s 3600 pages in a year. 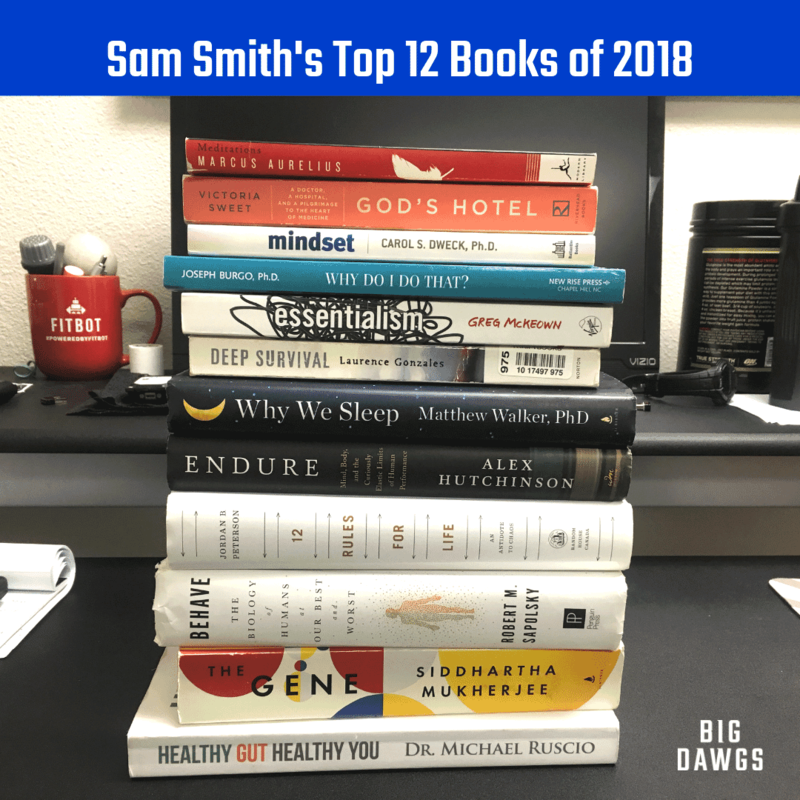 To help you start that journey, I pulled together a list of my 12 favorite books (in no particular order) from this past year. I hope you enjoy my short synopsis of these books and my favorited quotes. Let’s make 2019 a year of reading and knowledge building. As research continues to emerge showing how powerful gut health is for performance, mood, cognitive function, metabolism, energy, etc. it's only prudent that we spend time learning and understanding how we can manage and properly utilize that powerful system. Dr. Ruscio provides a great overview of all aspects relating to gut health backed by leading research within the field of gastroenterology amongst other fields. He finishes the book off with a 8 step plan for how to reset and reorganize our gut to allow for maximal growth and longevity. This was a fascinating book. If you treat symptoms, you’ll never get to the core of the issue. As in medicine, health, fitness, business you have to look at the whole picture. A great reminder that great principles transcend all fields. This was my favorite book of the year. I am a big fan of Dr. Peterson’s work so I’m a bit bias but life altering work, if the title didn’t give it away. Dr. Peterson gives a list of guidelines to implement in our lives that will allow us to carry the burden of life and overcome it through the pursuit of meaning. You could take an hour to read this, or a lifetime. One of the most prominent themes throughout the book was: acceptance. Despite the struggle, despite the failure, accept it and move forward. The mind is far more powerful than you think. This book gives deep insight into the far reaching limits of human performance. Quotes from the book will do it more justice than my short synopsis. Wow. This book was extremely fascinating. In my opinion, this book needs to be required reading for everyone. Dr. Walker lays out first hand research showing connections with all things we would prefer not to have in our lives due to a lack of sleep: metabolic disorders, cognitive decline, poor body composition, and poor perception of stress (amongst others). At the end of the day, we must honor biology. Sleep is an integral part of our body’s ability to grow, adapt, and properly interact in the world. Challenge yourself, and others, to sleep a bit more in 2019. You might be surprised what happens. A powerful book discussing Dr. Dweck’s work on the life altering difference between a fixed mindset and a growth mindset. By orienting ourselves towards growth, we see the potential in developing, refining, and becoming a better version of our current self. Too many people fall victim to a fixed perspective where the outcome is set, the ceiling for growth is fixed and there’s nothing they can do about it. Continually strive for growth and the unrelenting pursuit of development. For us to understand those around us better, we must first understand ourselves better. Dr. Burgo’s book allows the reader to examine themselves, the defenses we have, where they might stem from, and how we can disarm them. This one will make you uncomfortable at times. But, you will come out the other side with a greater appreciation for how you tick and how to become more aware of those triggers cultivating a deeper understanding for yourself. Less, but better. This book is very applicable to all of us living in a digital age where technology runs our lives. Greg’s work helps the reader see how much time and value is wasted by saying yes to too many things, being hyper-connected at all times, and losing sight of what’s truly meaningful to us. By removing the non-essentials in your life, clarity and quality will start to envelop your work. Great story telling of people in the most dire of circumstances. When the only thing that matters is surviving to tomorrow, the mind changes. People start to show who they really are. Situations where those who have a why to live will bare any how. This book was extremely fascinating. For someone who really appreciates behavior, this book was ice cream on a hot summer day. Sapolsky brings his lifetime of knowledge and experience in primatology, neurobiology, and neuroscience to break down how humans behave at our best and worst moments. Even though it’s a dense read, the material is so engaging, you won’t even realize you just read 50 pages. This was quite the read. Beautiful writing and storytelling about the history of the gene. For those of us who don’t have graduate degrees in cell biology or genetics, the intricacies around the evolution of how the gene was developed, discovered, and where its utility is leading us are truly fascinating. We can all glean some insight into how big a part our genetic heritage plays in our ability to develop as a human. But, that should never be the sole determiner in one’s potential to achieve, see “Mindset” for more insight on this.